To get more signatures, create a company account and be able to invite your colleagues to join you on Dokobit you can subscribe for a paid plan subscription anytime. For individuals, a "Professional" plan subscription is available, for smaller teams - "Business" plan and if you are planning to have more than 20 users, please contact us for an "Enterprise" plan solution. 1. Log in to the portal and click "Upgrade plan" link located at the top of the page. 2. Choose the appropriate plan. 3. Choose whether you would like to be billed monthly or yearly. Yearly subscription awards you with a discount. 4. If you choose "Business" plan you will be able to choose how many users you need by adjusting the slider. One user account (that would be yours) comes with the plan and additional users cost depends on the amount of users and whether you choose to pay monthly or yearly. 5. At the "Confirm and checkout" section review your order information and click "Go to checkout" button to proceed with your purchase. 6. Choose whether this is a personal or company account and fill in required fields. 7. If you chose to be billed monthly, enter you credit card details. 8. Review your order information and click the button "Buy". 9. You will be billed instantly and you will get an email with the invoice attached. Note: you will be charged monthly until you cancel your subscription. 10. If you chose to be billed yearly, you can choose whether you would like to pay with a credit card or via bank transfer. 11. 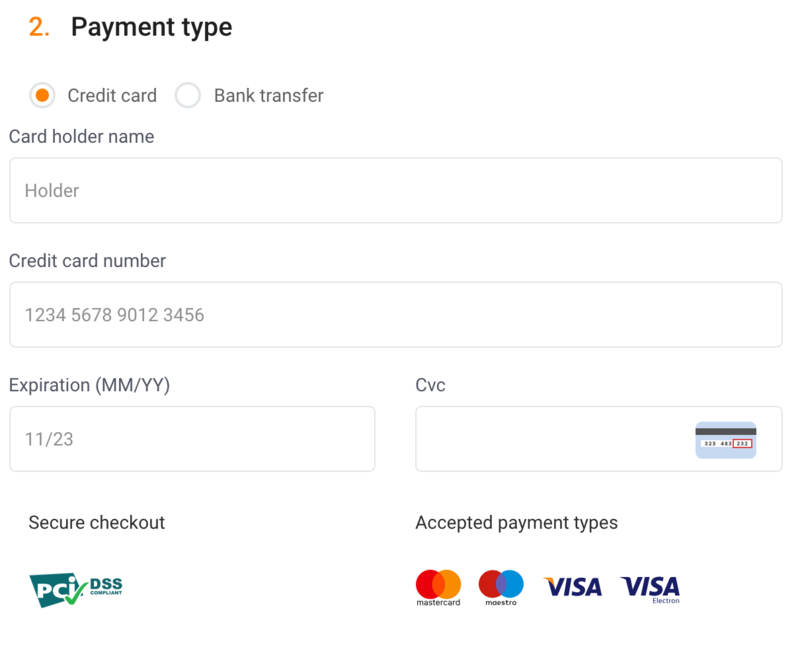 If you chose to pay by card, enter your credit card details, review your order information and click the button "Buy" to finalise the purchase. 12. You will be billed instantly and you will get an email with the invoice attached. Note: you will be charged yearly until you cancel your subscription. 13. If you chose to pay via bank transfer, review your order information and click the button "Buy" to finalise the purchase. 14. You will get an email with the invoice attached and you will have 30 calendar days to remit the payment. 15. If you already have a paid plan subscription and would like to change the plan, please contact us. 16. If you are planning to have more than 20 users, please contact us for an "Enterprise" plan solution.